The more I help clients grow their businesses, the more I see how “teamwork” is not a natural thang! Sure people like to belong, and people like to help in a common endeavour, but people are different and they have different values, habits and personalities. Ask your team to define “a job well done” and you will get a variety of different answers. This may not sound like a significant problem, but what if their different definitions of a job well done mean that they approach the joint task differently? To you, it might be okay to call out at team meetings discussing how to do something, and voice your ideas. To someone else, they might want to think through the problem and think that your calling out is just self-aggrandisement, and just plain rude. There may be a raft of other differences that can cause team members to be frustrated at each other and the way the team works. In a more formal structure, I have helped clients create team “charters” which outline what the team was formed to do, its objectives and scope, and its authority in doing the task. This can be an extremely useful document when you are forming a team within a team, especially where its members are not used to working together. Defining objective means that members can re-calibrate their progress against the stated objective. Often without a clear objective a team intended to resolve a problem with a product can end up trying to invent a new product. Nothing wrong with that except that you still have the original product with the problem, and you may not have the market or capability to launch a new product that was created without a need. The scope defined in a charter also keeps the work of the team within parameters – it clarifies how big the task is and to some extent how much time or cost they can expend. Without a clear scope the problem they are trying to solve may involve the way it interfaces with another team – who have no idea what changes to their work this team is about to unleash! Finally clear lines and levels of authority define who makes decisions at milestones, so that no one team suddenly creates new costs or strategies without the leadership approving the change. One of the definitions in a charter can also be used in less formal team structures, and that is some agreement of a code of conduct. Codes of conduct clarify how decisions are made, how meetings are held, how people act in disagreements, and how members work within the team. They may, for example talk about how being on time to meetings is to be valued, or that speaking up with your idea is to be accepted while following up ideas within a set time is also desirable. Codes of conduct make the team’s behaviour and therefore results more predictable. They reduce time spent in going over processes again, and can play a part in ensuring that disagreements happen less frequently and with less “heat”. Whether you write them out or not, codes of conduct will form. If you are a leader and you always arrive 10 minutes late for a meeting – guess what, in time meetings will automatically start 10 minutes from the time announced. They will also form – and indeed form against any written rules – if behaviours reinforce them. If you allow interruptions during meetings, then it becomes the code of conduct to allow interruptions. So, it’s much better for everyone’s level of frustration to set out an agreed code of conduct. How do you construct your team’s code of conduct? 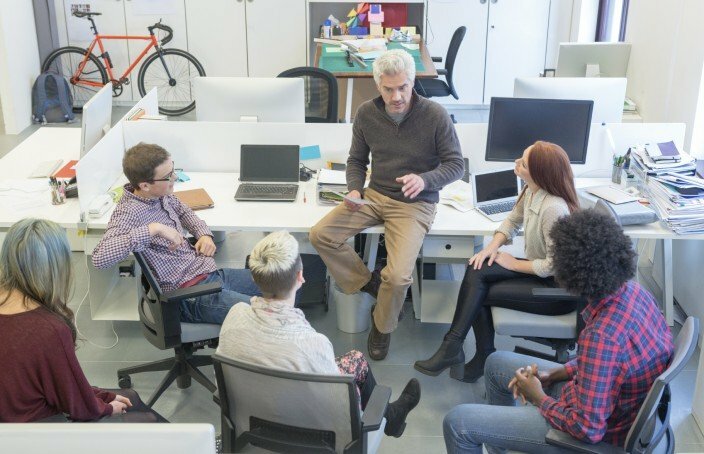 What behaviours are acceptable in getting to and at meetings? How are new ideas to be received and dealt with? How will decisions be made – is it by a vote, consensus, or is there a process of presentation and management approval? How will dissent be registered and dealt with? How will disputes be handled, and who will ultimately provide a “ruling”? How will feedback be provided and how often? Should reports and communication be in writing or in another manner? Based on this everyone can put up suggestions and post them on a whiteboard under each question. Team members should become familiar with everyone’s suggestions and score each suggestion out of 10 (10 being most valuable). The suggested answers to the questions with the most scores become the rules. To ensure that the code of conduct is properly applied, review it often. Review it for consistent application regularly, perhaps at the beginning of each meeting. Review it for examples of application whenever a new member joins so that it becomes a form of induction. Review it periodically, say once a quarter, to see if they should be reassessed and changed, remembering that the purpose of the code is not to be about the only correct way for the team to operate, but that it is the consistent way it operates. Finally, to ensure a code of conduct is followed and applied consistently, the leader has to lead. There’s no other way of saying this – if you are the leader and you do not follow the rules, then who needs to? Consistency means no exceptions. To get more of these tools to provide leadership, create strategy and grow your business, go to teikoh.com or subscribe to our email sending out new ideas. Do you use LACE when you communicate?